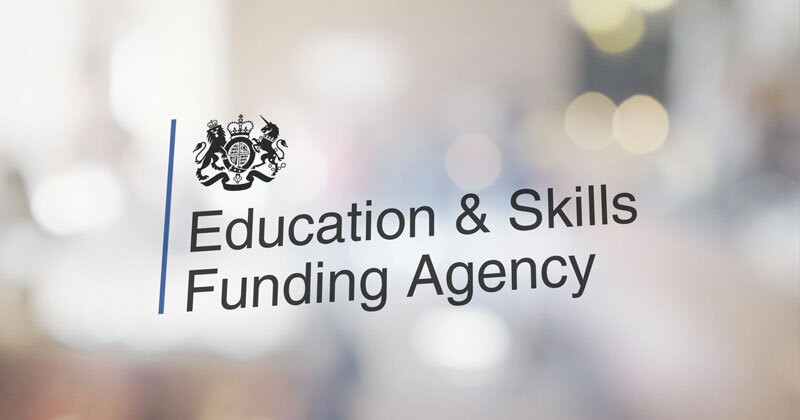 A cabinet office approved apprenticeship provider to government departments has had its levy funding terminated after a damning Ofsted report found it was ‘insufficient’ across the board, FE Week can reveal. The Education and Skills Funding Agency has taken the unusual step of ending the levy agreement with Premier People Solutions Limited, after inspectors warned its recruitment procedures were “not safe enough” and too many apprentices were prevented from receiving off-the-job training by employers. The provider, which trades as Premier Partnership, delivers apprenticeship training to government departments including the Department for Work and Pensions, HM Revenue and Customs and the UK Visas and Immigration service. According to the find apprenticeship training service, the company has been delivering apprenticeships to public sector departments for over six months. It had 686 apprentices at the time of the Ofsted visit, and all but five were on the level three public service delivery officer standard. It successfully tended to get onto the Crown Commercial Service call-off list from September 2017. The Crown Commercial Service List is an executive agency sponsored by the cabinet office. However, its early monitoring visit report from Ofsted has rated Premier People Solutions as making ‘insufficient progress’ in every possible category. This would normally lead to the provider facing a temporary ban from recruiting new starts, until a full inspection can be carried out within a year of the monitoring visit. However, skills minister Anne Milton has exclusively confirmed to FE Week that Premier People Solutions had its levy agreement terminated just three weeks after the damning inspection, and two days before the report was published today. “With effect from November 13, the ESFA terminated the levy agreement of Premier People Solutions Limited. The provider has been given 30 days’ notice and the agreement will end on December 12,” she said. 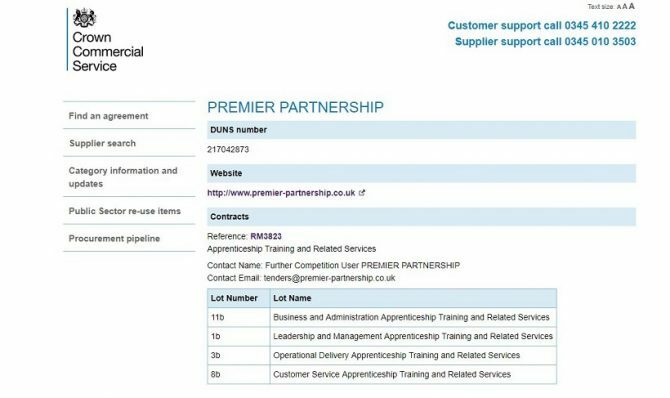 Premier People Solutions will now be removed from the register of apprenticeship training providers. The Ofsted report found the government departments were failing to release apprentices for the off-the-job training they are entitled to, and often refusing them permission to attend training. The relationship between leaders and employers was described as “weak”, and inspectors found that apprentices’ line managers do not participate in planning apprentices’ programmes or reviewing their progress. “Trainers do not take effective action to overcome employers’ lack of participation when visiting apprentices, and insufficient support from employers to their apprentices persists,” it said. Despite the fact the company’s apprentice tutors were going into sensitive government departments to deliver the service, the Ofsted report warned that leaders and managers “do not have safe enough recruitment procedures”. Leaders were also criticised for having an “overly optimistic view of the quality of their provision” and inspectors warned they are “not aware that they are not consistently meeting the principles and requirements of an apprenticeship”. Apprentices voiced concern about trainers changing frequently, leading to a “lack of continuity” which impedes their progress, and many were unsure about when they are due to complete their apprenticeship and unable to recall previous learning. Too few apprentices were found to have developed their English and maths skills “beyond the minimum requirements”. The report found that trainers had appropriate qualifications and commended leaders for significant investment in good quality e-learning materials to support apprentices, although it warned that “too few apprentices have access to these resources or use them”. The cabinet office confirmed that the government departments included HMRC, the DWP and the Home Office, including the UK Visas and Immigration service. When asked about the Ofsted criticisms concerning security, the spokesperson said it was for individual departments to comment. The spokesperson said: “Apprentices are core to our ambition to become a brilliant civil service. It is therefore vital that they are offered the best possible educational opportunities that will allow them to flourish in their career. David Pearson, managing director at Premier People Solutions, confirmed the provider was being removed from RoATP but insisted it takes safeguarding “extremely seriously”. He said: “We have worked hard to engage our clients with the new apprenticeships but have had considerable challenges around releasing learners for the learning time. This has prevented apprentices from accessing our training and I believe this is the key reason for our monitoring result and removal from RoATP. “We are working closely with the EFSA and our clients to ensure that all learners can continue their apprenticeship programmes and this is our key priority. We are also taking on board the content of our recent Ofsted report and in particular our approach to safeguarding. “With reference to the comments around safeguarding, Premier Partnership takes safeguarding extremely seriously and Ofsted noted that all of our team are appropriately trained, and our policies and procedures are sound and implemented. Having worked in this sector until last year as a trainer…I can sympathise with the training provider on this occasion. A government dept of all organisations should know better. Why are employers signing up to courses whose criteria they cannot honour? Why are Ofsted not able to also penalise the employers who have agreed to allow staff the time off of 20 percent of their working time and fail to do so? Staff like me leave because of unrealistic expectations and being over worked. Many trainer assessors do a lot of work for the admin side in their own time. Ofsted should also consider the well-being of staff who manage such high workloads .